I am a poet first, and many things besides, including massage therapist, teacher, dementia care social worker and certified poetry therapist. I have used poetry to work with children who begin the circle of life and for elders who close it, and I write fiction for children and young adults. 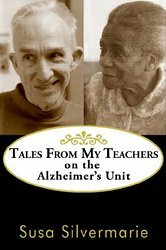 Click on cover to order my book of narrative poetry about an Alzheimer’s Unit where I was both Social Worker and Poetry Therapist. “This is poetry pared down to the people. And the people are pared down to the basics – “The Gentleman” holding on to his last dollar bill, Stella’s eyes twinkling from a picnic with her family and from her talk with an angel, Linda who hasn’t forgotten her need for sexual expression. What I mean by pared is what makes a poet great: the just exactly right words, carefully chosen: a respectful guiding of the reader toward the reader’s own lessons; a trust in the reader’s intelligence. Silvermarie has listened deeply to these old ones, seen deeply, felt deeply. This book is the happy result. Get it! Don’t wait!